The Queen has risen five places to 35 and Ms Wintour two places to 39. The Queen is one of eight women who appeared in the inaugural list in 2004. The others are Ms Gates, Ms Lagarde, Ms Clinton, PepsiCo chief Indra Nooyi, Oprah Winfrey and Ho Ching, who heads Singapore's sovereign wealth fund Temasek. Harry Potter author JK Rowling, who was 93rd last year, has been pushed out of the rankings by newcomers, including 43-year-old Sara Blakely (pictured), the undergarment entrepreneur who founded Spanx and is the youngest self-made billionaire on the list. In all there were 18 newcomers. Russian central bank governor Elvira Nabiullina (72) and Arundhati Bhattacharya (36), the chairman of the State Bank of India were among them and is Chinese actress Yao Chen. 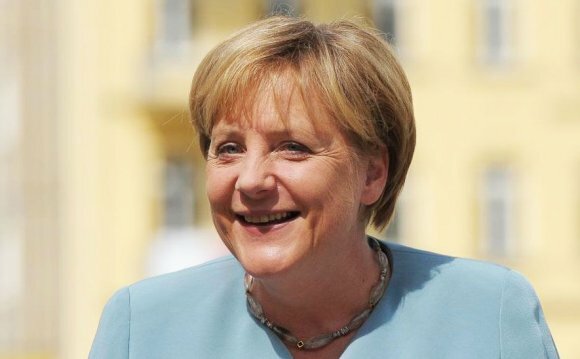 It is the ninth time the German Chancellor has made the list which features nine heads of state who run nations with a combined GDP of $11.1 trillion (£6.6 trillion). This year there are 28 chief executives who control $1.7 trillion in annual revenues, 18 who has founder their own companies or foundations, and 13 billionaires. Forbes says the 100 women have a combined social media footprint of more than 812m followers. • Members of the 2014 ranking represent women in 8 categories: technology, politics, business, finance, media, entertainment, philanthropy and NGOs, as well as billionaires. Finance was broken out from business as a new category this year. To determine the rank within each category, as well as overall rank on the list of 100, Forbes applied four metrics: money, media, impact and spheres of influence.